A haven for spinners, knitters and felters. See our FREE online magazine on our website at www.thatspinningplace.com. We are a fibre-loving small business in the beautiful Hawkesbury region, situated at the base of the Blue Mountains on the outskirts of Sydney, Australia. 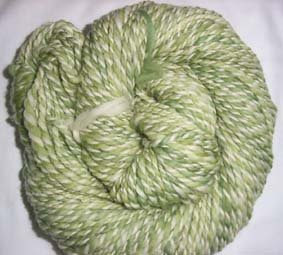 We ADORE natural fibres and keenly promote the use of handspun yarns and the ancient skill of handspinning. Our items are handmade, with care. 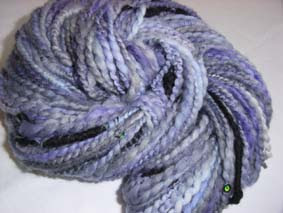 I've finally listed some new handspun yarns on the webstore!! I seem to have dropped off the face of the earth for a few months, but am back on the scene now! Here are some yarn photos for Jan to peek at. 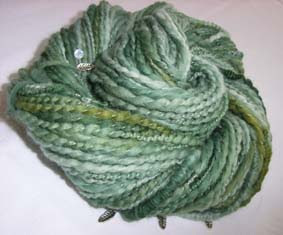 This is "Tree Shadow" handspun merino yarn. Back to the spinning wheel tonight... while watching a repeat of the great TV art show "Star Portraits," with Rolf Harris. I have seen the series before, but loved it. Good spinning viewing!! 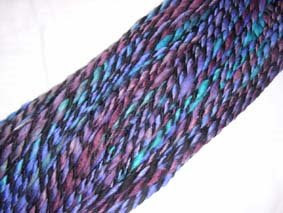 New Handspun Yarns Listed !! 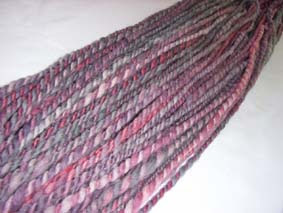 and "Purple Haze" Handspun Yarn. 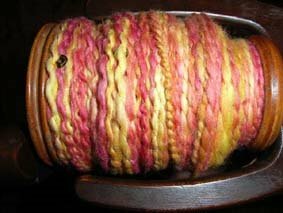 Back into spinning with a vengeance!! Here are some yarn photos for Steph to peek at. 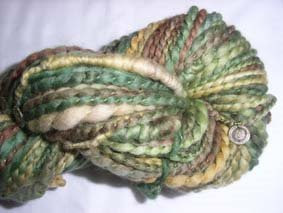 I'm finishing off some other custom spinning projects before I get some yarns and items together for the webstore. Very behind on things at the moment! Such a long time since I last blogged! I have been knitting these socks in Lorna's Laces Shepherd Sock Yarn in the purple iris colourway. They are a combination of components of socks in "Sensational Knitted Socks" by Charlene Schurch. I have been using the wonderful stitchkeepers which I got from The Loopy Ewe - thanks to Sheri for matching the colour of my stitchkeepers with the sock yarn!! Nice touch!! Shearing day at Alleena Alpaca Stud was VERY busy and thoroughly enjoyable. I managed to go home with bags more fleece - I only brought home really lovely quality fleece to play with -bad alpaca fleece is pretty nasty stuff to mess with, in my opinion. The shorn alpacas look funny with their fluffy heads, especially the babies. My extravangant order from The Loopy Ewe came - lovingly undone and rummaged through by Customs, with pamphlets from Australian Quarantine and all squished up again with sticky tape - THANKS CUSTOMS!! And stitckeepers for my sock dpn needles - these are great little doovers - much more effective than the little rubbery thingies I have been using previously, and safer for little kiddies who like to delve into knitting bags, as they cover the points. Great service from The Loopy Ewe, and I will be returning soon (Naughty!). Postage was only US$13.00 to Australia, which is very good compared to other stores! Lots of intellecual and writing pursuits happening as well - attended a Jane Austen Society Conference (yes, there is such a thing - it was great!) and have a NSW Writer's Centre workshop coming up soon. It is good to stretch the brain muscles. Austen Blog - Great daily read! Wanna See Some Great Bands?